Long unavailable to the general public, these “esoteric lessons and mantras” represent Rudolf Steiner’s final word on the appropriate spiritual path for those who desire to engage in a contemporary and initiatory meditative practice, a path of self-knowledge leading to world knowledge, enabling anyone earnestly willing to enter into the experience and understanding of the spiritual realities that surround us. In his lifetime, Rudolf Steiner insisted that the Lessons not be printed in any form. But over the years, so many pirated versions containing multiple errors and falsifications appeared, that the decision was made to print an official version, but access to it was severely limited. Rudolf Steiner certainly believed, however, that esoteric knowledge and teaching should not be withheld from the general public but be made generally available to anyone who sought it—as this edition is. These Lessons, given and appearing under the sign of the Archangel Michael and thus sometimes also called “the lessons of the Michael School”—or the “Michael Lessons”—must be reckoned as one of Rudolf Steiner’s deepest gifts to posterity. Though the path the Lessons present is “esoteric,” no one should for this reason feel excluded. Indeed, anyone who has found sustenance in earlier works such as “How to Know Higher Worlds” or “Theosophy” should feel themselves fully prepared and invited to enter the transformative world of the Lessons. The prerequisites for taking this path are a will fired by a healthy common sense and a healthy trust in the human capacity to develop and enter into the field of spiritual knowledge. The path described here stretches over nineteen lessons, or levels, that will perhaps be challenging to many seekers. It is however a secure path. Those who enter upon this path strengthen themselves to meet the dangers of self-illusion, such as grandiosity and vanity. There is a vitality, a life force, a quickening that is translated through you into action, because there is only one of you in all time, this expression is unique. If you block it, it will never exist through any other medium. It will be lost. The world will not have it. It is not your business to determine how good it is, nor how valuable it is, nor how it compares with other expressions. It is your business to keep it yours clearly and directly, to keep the channel open. You do not even have to believe in yourself or your works. You have to keep open and aware directly to the urges that motivate you. Keep the channel open. There is no satisfaction whatever at any time. There is only a queer, divine dissatisfaction, a blessed unrest that keeps us marching and makes us more alive. Rudolf Steiner wrote about Nervousness and I-ness in a short lecture in January 1912. It was his words that drives home what Martha Graham was saying to Agnes De Mille. It is this “nervousness made up of precisely of the unused potential of the self” that Steiner describes as being without a goal that keeps us spinning in wonderings and wanderings of our inner storyteller that takes such pleasure in making us second guess ourselves. My inner storyteller has been quiet lately as I have clear goals aligned with my mission, but it was not always this way, and I am sure as every trail has forks my inner lizard will rejoin me again. Self-doubt in the form of nervousness is alive and well in our modern world, but some remedies can help us overcome it. In this lecture, Steiner describes the importance of attention and the essence of the human being through its connection through the world. It is by connecting to the natural world, where we can quiet the inner dialog that distracts us. Self-doubt is an attention thief. It keeps us from making decisions and trusting our intuitive knowledge. It casts doubt on everything. Children learn from watching those who care for them. Nervousness is like a virus that is quickly spread. Taking time to connect with yourself through a daily nature practice will help quiet the voices of doubt and build your immunity to the dis-ease of nervousness. It will strengthen your child's immunity to self-doubt too. You can strengthen your resistance to nervousness by finding practices that require no decision making. Taking a few moments each day to sit and connect with nature in the same spot is a decision. Practicing this decision process builds the muscles while also resting the mind. All you have to do is sit still, close your eyes, and be with nature. The earth will take care of the rest. This post originally appeared on Kathy Donchak's personal blog on March 25, 2018. The revolutionary ideas that come to education in the future will come from the hoards of parents leading the experimental movement called homeschooling. I am reading a new book that was sent by Steiner Books, one that a few sentences into the first chapter, I said: “oh my…”. Books are my favorite way to learn of new ideas, and consider them against my own beliefs and experiences. This book had an energy to it. I knew I would want to share it but not in the physical sense - get your own! This one will be on my bookshelf to share with my kids. I consider books an asset of ideas to pass down to my kids. What if you had a personal collection of books, and notes to tell your kids how it changed your thinking? A hope chest or bottom drawer of ideas to consider has been whirling in my mind for a while now. A physical collection of ideas to consider as they make their way in the world. My father was a reader; he loved a good crime novel or book of history. We traded books often when we lived nearby, and later in life when I moved out of state and Amazon became my gift (book) delivery service, I would send him books I thought he would enjoy. Home library collections can show the journey of discovery over our lifespan. As families dive into the possibility of directing their child’s education, Waldorf education is likely to come into view. As I began searching for methods to consider with my children, the healing power of sunlight diffused rooms, natural materials, beautiful chalk drawings drew me in without even as much as a small understanding of Rudolf Steiner’s philosophy on education. It just felt right. How many things in our lives just feel right? The book I chose for my first read was Anthroposophy in Everyday Life: Four Lectures by Rudolf Steiner published by Steiner Books. The book drew me in from the introduction. As parents dive into the world of home education, they will find themselves in a sea of opinions and habits of others. Without realizing it, we look to authorities to see our way, not governmental authorities necessarily, but rather individuals that have become an expert in homeschooling. I would venture to say there is no such thing. We need thought leaders and visionaries to share ideas without authority, much like our hope chest of ideas to consider. I believe in my small understanding of Steiner; he gave indications for learning which is what will bring the revolution needed in education. As a visionary, his thinking was years ahead of others, but it is time we begin to unwrap his thoughtful gifts for the well-being of our children and theirs. My initial thoughts on Practical Training in Thought Karlsruhe, January 18,1909. If we embarked on this journey of directing our children’s education through homeschooling to help them retain and discover who they are and what their journey through life will bring to the world, then Practical Training in Thought is an essential foundational skill.
" When something really practical has been invented, it has often been done by a person without practical knowledge of that particular subject." R.S. This statement confirms what millions of parents are doing worldwide for their children by directing their education. The innovations of business, science, the arts, and design thinking are coming together in pursuit of a vibrant, safe education for our children. Training your thought begins with practicing in nature. 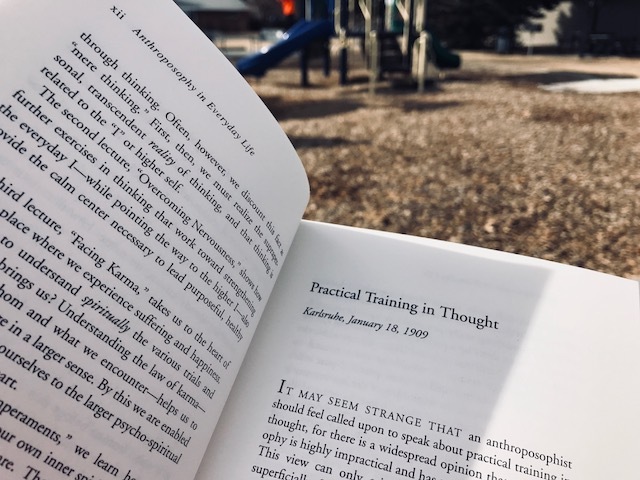 It is something I do without even thinking, but Steiner's words remind me that we must practice objective thinking and nature allows us the perfect connection. I don't want to ruin the experience for you by telling you every detail, but take a moment each day and look up at the sky. Don't try to define the type of clouds or predict the weather, just observe and you are well on your way to training your thinking mind. I will share more of my impressions from Anthroposophy in Everyday Life: Four Lectures by Rudolf Steiner by Steiner Books, but why wait? Order your copy and read along with me.